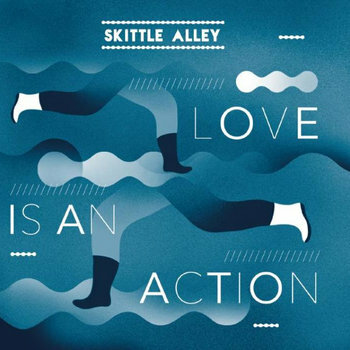 I don't know much about Skittle Alley (the name seems to be misspelled on the Soundcloud clip). If my research is correct the band is the bedroom recording project of Carlos Rene. I think both Carlos and his bedroom are in Madrid. I discovered the song "Boy Meets Girl", and think it is terrific. It is from and album named Love Is An Action, which is available at the links below. It is lovely, euphoric pop music. Turn it up and let it wash over you. Finland's Black Lizard will release Solarize, their second LP, via Soliti Music this spring. Expect more of their thick, muscular blend of garage and shoegaze, but with synths added to fill out the sound. You can test out the first single from the album, "All Her Time". Here in the executive dining room of WYMA headquarters the main topic of conversation is the great news that Courtney Barnett's frequent touring of late hasn't prevented her from writing new music. In fact, we are looking forward to the release of Sometimes I Sit and Think, and Sometimes I Just Sit (likely to be called Sometimes or SISATASIJS by most music writers) on March 24. We know what to expect: Wryly crafted observations with humor, self-awareness and probably some regret and sorrow. And our expectations are high. Our first taste comes courtesy of the video for album track "Pedestrian At Best", in which Courtney seems to make fun or her own recent fame and holds others at arms length with self-deprecation and a critical eye. The Black Watch is a long-standing cult band founded by John Andrew Fredrick in the late '80s. They have released a number of LPs with various line-ups. The one constant is Fredrick -- singer, songwriter and, for Sugarplum Fairy, Sugarplum Fairy, the sole musician for all instruments other than drums. I confess to being thoroughly impressed by the fact that after all of those years of flying under the radar and enduring membership changes, Fredrick still sounds fully engaged and vital. His songwriting is varied and uniformly assured. The lyrics are literate and clever, and the vocal delivery expressive and sincere. The songs on the album are varied, with jaunty indie pop balanced with gentle near-lullabies and a few taut post-punk and shoegazy compositions. The guitar tones are interesting and range from buzz and crunch to restrained acoustic strumming. It is an album that deserves repeated listens, but more importantly, it rewards repeated listens. Fredrick has a knack for simultaneously discussing relationships in a straightforward manner and displaying a cold-eyed self-awareness of the prospective dangers. For example, in one of my favorite tracks, "Anne of Leaves", Fredrick notes that he has only talked to to his hoped-to-be-paramour for two drinks before he had to catch a plane, that he has a bright impression of her that he knows will not last, but he nevertheless will return to her side as soon as possible. I don't know about you, but that could be a summary of a few dozen chapters in my life, just stated more cleverly. Sugarplum Fairy, Sugarplum Fairy is out now via Pop Culture Press Records. Dubarry, from Australia's Sunshine Coast, creates electronic music with world beat and dub elements. They are said to deliver a smashing live show as well. Let your introduction be their new "Depth of Perception". Well conceived and executed, the tribal percussion is outstanding. Dubarry are Brett Gadenne, Kate Gadenne, Damian Campbell and, from time to time, Adam Scriven and Chelsea Campbell-Wilson. One of our favorite discoveries last year was the Junk EP from Glasgow band Tuff Love (here). Then a trio, Julie Eisenstein (guitar/vocals) and Suse Bear (bass/vocals) now work as a duo. We are happy to report that the release of their second EP, Dross, is fewer than two weeks away. The first single from the new record was "Slammer", which we featured last November (here). We now have the video for a second track, "That's Right". Packed with crunchy guitar, burly bass and gooey harmonies, it is just what we need to brighten up our winter days. Dross EP will be released via Scotland's Lost Map Records. You may find the name H. Grimace awkward, or you may find it memorable. But we strongly suggest that you find the band's I Am Material EP. It is available as a cassette or download (i.e. iTunes), and the songs are terrific. The EP commences with standout track "Imogen". Throbbing, woozy and urgent, you have my permission to fall in love with this band at first song. I did. The following track "Royal Hush" initially slows the pace, but is suffused with an ominous intensity that builds to a satisfying release. "To The Shaggerston" moves into '90s alt guitar/shoegaze territory with muscle and attitude. "Immaterial Girl" and "Great Divide" are fulsome slices of crunchy indie rock, with intertwined guitars and clever hooks. Closing track "Wasted Sun" is a slow tempo, brooding jam that leaves you wanting more. We have provided three tracks below, and you can stream the entire album at the Soundcloud and Bandcamp links below. H. Grimace is a London-based four piece founded by Hannah Gledhill (guitar/vocals) and Asher Preston (drums/vocals). More recently they added Shan Pasha (bass) and Marcus P. Browne (guitar). I Am Material EP is out now via Soft Power Records. The band will be touring the United States this winter with San Francisco band Couches. Mann Friday is a London-based band comprise of musicians from South Africa, Zimbabwe and Italy. Their decade on the scene has produced five studio albums and a number of fans of their Afro-folk-rock. But their remaining dream is to play a stage at Glastonbury. To that end, they have crafted this musical plea to the festival's organizer, Emily Eavis. The simple and sincere request to Emily is to "say yeah", and book Mann Friday for the gig. We here at WYMA aren't going to pretend that Emily's job is easy, or that she can or should give in to every request for a piece of the stage. But we founded this blog to help promote the dreams of the artists that were reaching for a higher rung on the ladder. We think that "Say Yeah" is a fine tune, so from the suburbs of Seattle on a Sunday night, we'll make a long distance pitch to Emily: Say Yeah. Marie Seyrat, a young lady from France, and Bruce Driscoll, a young man from Michigan, and a common love of warm pop songs combine to form Los Angeles-based duo Freedom Fry. They released an EP last August and have several videos of songs on their website. But today's post is to introduce their first song of 2015, the incredibly catchy "Shaky Ground (Hey Na Na Na)".